I can only imagine what it’s like to visit a watering hole where ghosts or other freaky apparitions make an appearance. In the good ‘ol US of A our bars don’t have that problem (although we do have a few of the world’s most haunted places). But in England, there are some pubs with a record for unnaturally haunting experiences. Would you drink at a place called the Bucket of Blood? It’s like they went out of their way to make this place haunted. The name comes from a legend saying how the landlord visited the water well, but instead of bringing up water he got a bucket of blood. Strange noises and ghostly figures have been seen around the joint. 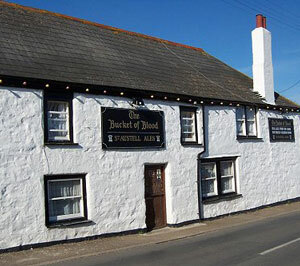 How about The Devil’s Stone Inn: this place is named after a strange, huge rock that wound up in the village of North Devon. Nobody knows how the stone got there, but this 400-year-old pub is haunted by association apparently. Lights turn themselves on and off, plus the typical “paranormal sounds” have been reported. Are these genuine hauntings or clever marketing ploys? Of course, get a guy drunk enough and you can convince him you’re Ann Coulter under the right circumstances. Check out the rest here if you’re interested in more haunted pubs.